There is always a lot of interest in presentations and demos on spalting for woodturning / woodworking clubs. I have done these types of presentations in the past and will continue to be available for presentations as my schedule allows. Please note that I usually book out over a year in advance, so unless you are within a two hour distance of my town, when you contact me, please try to schedule meetings at least one year from your contact date. Due to the time commitment required for such presentations and the growing needs of my family to actually see me once in a while, I do generally ask for my travel / lodging / food expenses to be covered, as well as an honorarium to be provided. Honorariums are based upon the type of presentation / demo required and the length of the presentation, but are generally in the $250 range for a typical evening meeting that I can drive to and back from in one day (3 hours or less per direction). Evening meetings that require an overnight, but I can still drive to, run between $350-$450 (4-5 hours per direction). Evening meetings I have to fly to run $500. Full day demos run between $750-$1000 for up to eight hours. Cost difference depends on the ratio of lecture to woodworking involved, and distance to travel. Working with spalted wood is a completely different ball game than working with sound wood. It requires different machining techniques and a whole lot of patience and anatomical understanding. Especially in the field of woodturning, I do not woodturn like you might expect. 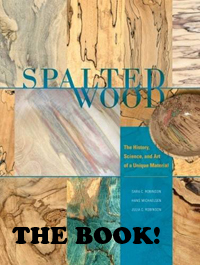 I have been working almost exclusively with spalted wood for twenty-five years. During that time I have developed skills and tool grinds that work best for me and the type of wood I use. Because of the way I turn, I seldom if ever experience blow ups or torn grain. But because of the way I turn, I have been ridiculed as well. If you are considering having me for a turning demo, please be prepared to come with an open mind to alternative turning techniques. For questions and / or to check on presentation availability, please e-mail me here.